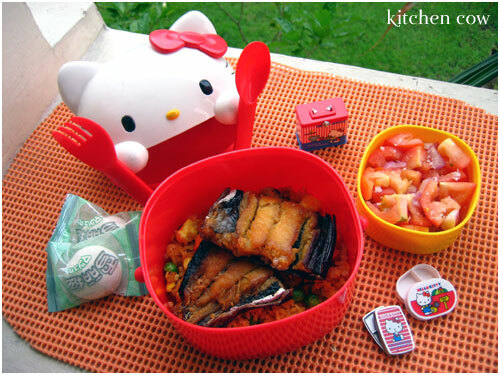 I love simple bentos with simple yet delicious comfort food. Paired with something that truly brings out its flavor, something as simple as Tinapang Bangus (Smoked Milkfish) can be as infinitely satisfying as complicated, sophisticated preparations. And it looks like Hello Kitty agrees with me, judging by her “ready-to-pounce” stance. Keep away Kitty, the fish is mine! â€¢ Fried Rice. An everything but the kitchen sink affair, I threw anything that looks interesting in there. So, along with the leftover rice from dinner, I sauteed aligue (Crab fat), more flaked tinapa meat, scrambled egg, and frozen mixed vegetables–peas, corn & carrots. â€¢ Tomato & Onion salad. A classic Filipino side salad, this is delicious with fried fish, and just about anything else. Fresh tomatoes are diced then mixed with chopped red onions, then sprinkled with sea salt. â€¢ Yay! Green tea-filled marshmallows! Yes, those little trinkets around the Hello Kitty bento (shown assembled here) are smaller Hello Kitty Bento 😀 They’re Hello Kitty Miniatures from the Vintage Minis line. I bought them for my Pinky:ST collection but don’t they look nice with the “giant” Hello Kitty Bento set? Fried Rice + Egg + Tinapang Bangus + Fresh Tomatoes = Best Breakfast Combo! I swear, if not for a certain Turtle and Monkey duo singing a song for this kind of fish, I wouldn’t be a lover of fishy meals. YUM YUM YUM! pero di ko sha puwede kainin. huhuhuhuhuhu! Winner no? And to think I only recently discovered how better it was when you fried the insides of the fish as well, instead of just the outsides as we used to do. Focus on what you can eat instead 😀 You’ll be killing yourself, pining away for food you can’t eat right now. Hang in there, just a few more days.